Though it's narratively, visually and aurally filled with anguish and sorrow, I Am Setsuna's charming personality has the strength and the warmth to melt all but the iciest of hearts, which couldn't make me happier. Soft snow crunches underfoot. Gentle, serene piano sighs to a sorrowful, lamenting crescendo. The white, blanketed boughs of the conifers collapse under the weight of the glimmering frost and biting ice. Welcome to I Am Setsuna‘s cold, bleak yet irresistibly resplendent winter world. Bring warm clothes and tissues. 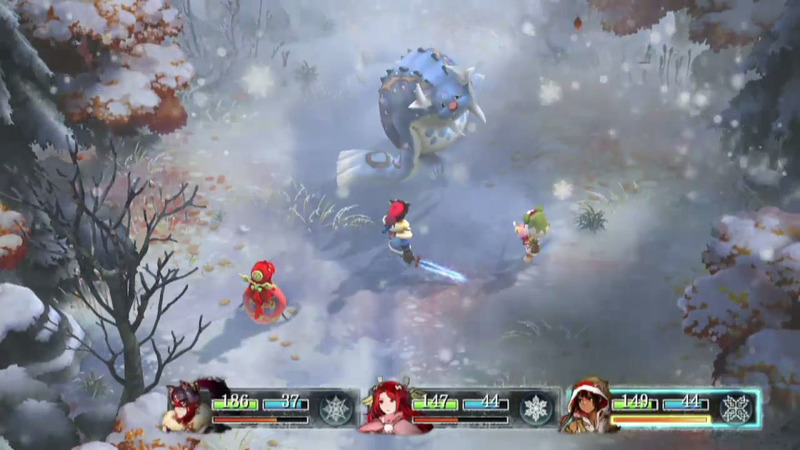 I Am Setsuna is a Japanese-developed RPG that arrived last year for PS4, PC and PS Vita (the latter’s release was solely published in Japan). It’s been developed by Square Enix’s freshly assembled Tokyo RPG Factory, a team who has been consigned the singular goal of crafting classically styled JRPGS that harken back to the SNES and PS1 days of yore. Their debut title is one of a handful of games that has launched alongside Nintendo’s newest piece of hardware and serves to help enrich the Big N’s meagre launch lineup, particularly for gamers like me who missed out on the title at its initial launch. Before I get into things, I really want to lay all my cards on the table; I’m a huge fan of JRPGs, however, that passion has been a reasonably new one. For reasons unbeknownst to me, I never had the opportunity of playing the classic RPGs of yesteryear. Chrono Trigger (which never had a formal PS release in the EU), Final Fantasy, Suikoden et al, all seemed to pass me by for some unknown reason — please, don’t judge me! It’s safe to say that my true entry point into the genre was Ni No Kuni: Wrath of the White Witch on PS3 — which I absolutely adored. 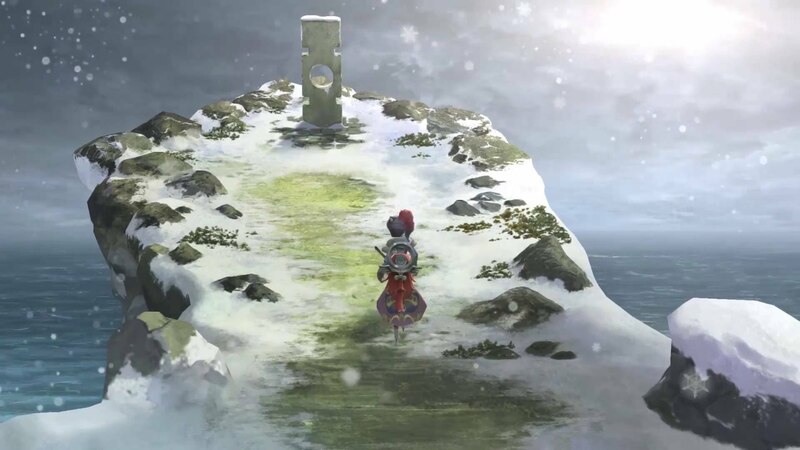 Long story short, I’ve been meaning to go back and play some of those classic JRPGs, but that motivation has been elevated, particularly after playing I Am Setsuna, a game that’s sole remit is laser-focused on emulating the visionary and influential Japanese-developed RPGs from the mid-nineties and early-noughties. I Am Setsuna’s story brings into sharp focus a desolate icy kingdom beset by evil monsters. In order to protect the realm and ward off the growing horde, local tradition dictates that a human sacrifice is to be offered every decade. Thus, the sacrificial pilgrimage was created; a long, arduous journey through monster-infested territories to deliver the sacrifice to the ancient Last Lands and help push back the monsters that have plagued the kingdom. Narratively, I Am Setsuna does a lot of things right. Even without the emotional cadence of traditional voice work, I Am Setsuna’s poignant writing, tight pacing and heartfelt dialogue is subtle and nuanced enough to stand tall amongst its modern contemporaries. It’s a thematically rich spider web of death, regret, destiny, fear and loss, which is not only delicately stitched together with a befittingly ice-cold aesthetic, but understands its identity and cleverly plays directly to its utmost strengths. 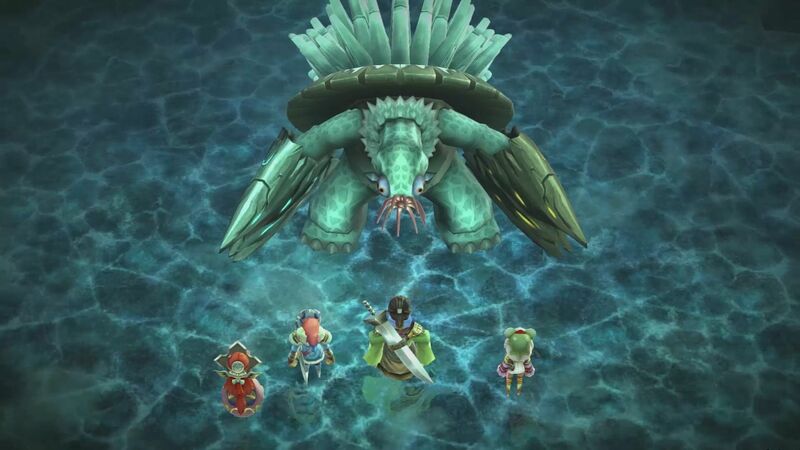 Essentially, the game doubles down on its somber tone with myriad layers of introspective characterization; Endir is a cold-hearted assassin on a personal path to redemption; Nidr is an old pilgrimage’s failed body guard whose failure rests on his shoulders like Atlas wrestling his own earth-shaped punishment; and then there’s the titular Setsuna, the holy sacrifice who somewhat ironically brims with zest and life, whose selfless actions instil hope in the warmth and compassion of mankind — these may’ve been tropes in previous games, but here they are handled deftly and smartly. Tonally, it dextrously straddles the line between cold, bleak despair and the soft glow of life and hope, and this is undoubtedly one of the strongest and most distinctive elements of the game’s charming personality. Selecting enemies to assault and going into the item menu during battle pauses the combat and gives you an opportunity to weigh up your tactical choices. Though you cannot directly move your characters during combat, some of your special moves (or Spritnites, as the game refers to them) can place you into different positions on the battleground. Over time, you do begin to see benefits to a) positioning your party carefully and b) choosing your targets wisely. Certain attacks, such as Endir’s sweeping Cyclone (which is an area-of-attack assault that knocks enemies back) and Aeterna’s X-Strike special move (which can potentially cut through rows of adversaries if lined up correctly) can deal damage to multiple opponents if executed accurately. As you make progress, the many nuances of its turn-based combat begin to slot into place and thankfully becomes a pretty snug fit. That said, I Am Setsuna can still throw some pretty stiff difficulty spikes at you, particularly in the boss battles. My advice would be to save often and stock up on supplies when the opportunities arise. Visually, I Am Setsuna is delightfully polished and its beauty is often laid bare in the smallest of details. Little wisps of vapour linger in the icy air as your party’s characters breathe. Monsters and party members leave trails in the snow as they move through the wintry, glacial world. And add to that some neat little character animations during scenes of dialogue — such as wee shakes of their heads, nods and shrugs. These all combine to really help to breathe life into the title’s charming, mesmeric and melancholy world. It’d be remiss of me not to mention Tomoki Miyoshi’s stunning piano soundtrack, which is a marvellous aural highlight. Each locale you visit is gifted with its own bittersweet, uniquely haunting melody, which adds an extra layer of somber melancholy to the game’s already frosty and austere world. Often, I would just pause the game and take in the wonderful, dulcet tones that Miyoshi has crafted — if that’s not a sign of a great soundtrack, I don’t know what is. I Am Setsuna is an accomplished debut from Tokyo RPG Factory and a heartening sign of things to come for the studio. It fits perfectly on Switch’s handheld format and works well on the big screen, too. Though it’s narratively, visually and aurally filled with anguish and sorrow, I Am Setsuna‘s charming personality has the strength and the warmth to melt all but the iciest of hearts, which couldn’t make me happier. This review is based on the Nintendo Switch version of the game.